Laura Brutscher, who earned her doctorate in the Department of Microbiology and Immunology in MSU's College of Agriculture and College of Letters and Science, published her study on the mechanisms honey bees use to fight off viruses in Scientific Reports. "This project has taken a lot of patience, time and perseverance, so it's personally validating to know that my work has been accepted by the scientific community," Brutscher said. Brutscher co-authored her paper, "Virus and dsRNA-triggered transcriptional responses reveal key components of honey bee antiviral defense," with her doctoral adviser Michelle Flenniken, assistant professor in MSU's Department of Plant Sciences and Plant Pathology, and Katie Daughenbaugh, a research associate in the Flenniken lab. "We expected that virus-sequence specific dsRNA would reduce virus infection via a common insect antiviral mechanism called RNA interference," Flenniken said. "In addition, we expanded on previous work that revealed that honey bee antiviral defense is also mediated by non-sequence specific dsRNA. This more 'general' antiviral defense mechanism is less well characterized and very interesting given that honey bees live in colonies, which include over 40,000 individuals living in close proximity—an ideal setting for virus transmission." Using next-generation RNA sequencing, Brutscher determined which genes were turned on under various conditions. Hundreds of genes were activated, but Brutscher focused on the role of two genes that may be key to honey bees' antiviral defense. "If these genes prove to be important for honey bees to fend off all viruses, then we could selectively breed colonies that have greater expression of these genes," Flenniken said. Brutscher, who grew up on a dairy farm in Little Falls, Minnesota, was always fascinated by the managed honey bees and wild bees that pollinated her family's sunflower fields. After receiving a bachelor's degree in biology in 2012 from Concordia College in Moorhead, Minnesota, she came to MSU through its Molecular BioSciences Program to pursue a doctorate in microbiology and immunology. Interested in host-pathogen interactions, Brutscher was intrigued by Flenniken's research after seeing her give a presentation about it. Brutscher joined Flenniken's lab in 2013 and that same year received a Project Apis m.-Costco Fellowship, which provided her with $50,000 annually for three years to research honey bees and the pathogens that infect them. In addition to publishing her research in Scientific Reports, Brutscher has also written three first-author reviews and co-authored three articles. Flenniken, who is co-director of the Pollinator Health Center at MSU, which was established last year, said researchers have determined which pathogens most correlate with poor colony health and colony losses in particular studies, but no one has identified a particular pathogen that is responsible for colony deaths. That's because there are likely multiple factors contributing to the problem including pathogens, pesticide exposure, and lack of quality forage and habitat. Bee colony losses have been a major concern in the U.S. since 2006 with losses averaging 33 percent annually – nearly three times the prior historical loss rate. Ranked second nationally in honey production, Montana's roughly 150,000 honey bee colonies yielded 15 million pounds of honey valued at more than $31 million in 2013. As for Brutscher, she's modest about her work. "Our methods to inject bees with viruses have been used in a lot of other organisms," she said. "There are numerous bee scientists who are working on all sorts of factors related to colony loss in addition to virus infections – for example, pesticide exposure, queen bee reproductive health, and nutrition – it's a multifaceted problem." "We're doing fundamental work that may lead to more applied research that could be used in bee-breeding practices," she said. "We hope our work will eventually contribute to reducing colony losses." 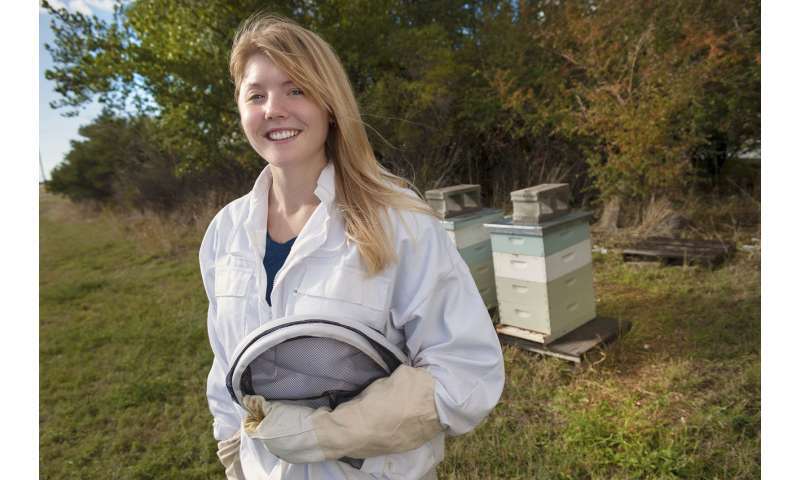 Currently doing research in Flenniken's lab, Brutscher will begin a postdoctoral position in January at University of California Davis, where she will also pursue honey bee research.